What is Safety factor / Factor of safety ? In the design of machine members, it is necessary to understand the Safety factor (SF). It is also known as Factor of safety (FoS). It describes that the load carrying capacity of any designed member. How much stronger the system than the expected or intended. Make sense? Let’s get into the topic thoroughly. It is defined as the ratio of the Maximum Stress to the applicable Working stress. Further, we can describe the factor of safety between the ductile materials and the brittle materials. For Ductile materials, the yield point is defined so the factor of safety can be defined as the ratio of the Yield point stress to the Working stress. The factor of safety (FoS) = Yield point stress/ Working stress. For Brittle materials, the yield point is cannot be defined well. so the factor of safety can be defined as the ratio of the Ultimate stress to the Working stress. The factor of safety (FoS) = Ultimate stress/ Working stress. Have you heard Service factor? And the term Service factor is not to be confused with the Safety factor. Service factor is the ratio of the capacity to the duty. Here we are talking about the oversizing the life of a product. If Service factor is 1.50 that means the device can be operated at 50% more load than its rated capacity without breakdown. Whereas the Safety factor will be considered in the designing methodologies to determine at which point it is going to fail. 2.78 is the Service factor. And not only with the speed, there are so many other factors like stress, torque, etc that we can calculate the Service Factor. Generally, torque is the most significant factor to calculate service factor. 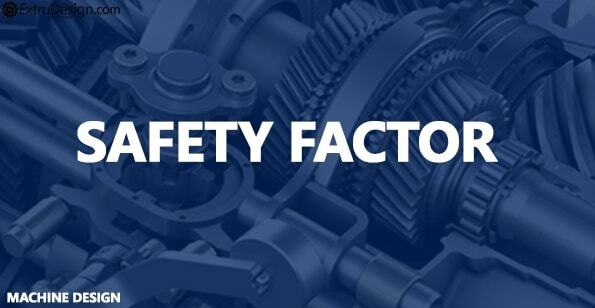 The safety factor for any machine or machine part can be defined as the Capacity divided by the Duty or operating condition of the machine part. It is So helpful for mechanical students. Thank you Sunil. Glad you like it.